The question had to be asked of Bruce Arians when it comes to how he’ll allocate his time considering he’s made a big effort to tell seemingly everyone that he won’t be doing a lot of what he used to do when he coached the Arizona Cardinals. Joe laid it on Arians this morning at the swanky Arizona Biltmore resort. JoeBucsFan.com: Coach, no disrespect from this question. You’ve said that you didn’t want to coach coaches this time around and that weren’t calling plays and you were going to try to stay out of Byron Leftwich’s way if you could, and you have full trust in Todd Bowles, and you’re healthy. So with all this sort of extra time that you’re going to have, where is that going to go? Toward personnel? Bucco Bruce Arians: A lot more personnel with Jason. And also looking at game management situations that maybe I screwed up those five years [in Arizona.] Can’t say there were many, but there were situations because I get very angry at officials sometimes and lose sight of some things. That’s why I hired [retired official] Larry Rose, just to let me know if I’m right when I’m hollering at them or not. But yeah, that part of it, continuing to go more room to room, you know, and just see things how they’re going. Do more individual teaching than just sitting in the quarterback room or putting the installation in. I’ll be in there but I want to take a backseat to watching another great young coach grow, also [to see] who’s taking notes, who’s not taking notes [among players]. Great answer by Arians, and it just reinforces how much of a heavy hand he’ll have in every aspect of the team. This is Arians’ ship, and Joe’s quite sure everyone knows. I liked his answer. Thanks for asking Joe. Licht said he would be leaning on BA in free agency and even the draft. Hopefully the end results are positive. This is kind of what worries me. We are not getting BA the “Quarterback whisperer”. That to me is where he bring the most value to this team. If he isn’t directly influencing the QB on a daily basis that worries me. That’s great he has all this faith in Byron Leftwich and CC but I don’t. I still think Jameis plays much better with the support he will get that he didn’t have before. Music to my ears Joe … ” This is Arians’ ship, and Joe’s quite sure everyone knows”. BA talked a very positive game when he got here, but he’s certainly been around enough to know what’s what. He inherited a mess IMO, and it’ll probably take 2, maybe 3, years to fix it. 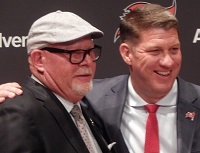 Things seem to be falling into place slowly (coaching staff, a few new players, etc) but unless we have a superb draft, my gut tells me that 2019 won’t be a banner year for the Bucs. What I’m looking for is improved play from some of our younger players, especially on defense. Got a LOT of faith in Todd Bowles as a DC, but he’s not a magician. If the talent’s not there, the wins won’t be either. I recently read the quarterback whisperer. It was a fun read and after I finished it I felt way more confident in BA’s abilities. Not just in what he can do for a QB but in the way he can evaluate players. It made me believe him more when he talked about the talent on the team. I guess we’ll find out if he’s right about that. I know he just gave the impression that he wouldn’t be as hands-on with jameis as we all want him in to be, but after reading the book I can’t see him not being able to do just that. It’s too much of what he’s about. I don’t know if he can turn the Bucs around in one season, but I do believe we’ll see Jameis turn into an elite QB. I think Jameis needs to find a way to lead the team and have the respect of his teammates. That’s the only part of BA’s necessary qualities to be a great QB that Jameis seems deficient in. The UBER incident, to me, is what set him back in respects to that. Also, eating W’s didn’t help. But BA helped Big Ben during his perv-related scandal, so maybe he can help Jameis put that behind him and command the respect of the players. Good. We haven’t had an all around experience HC in a while. Schiano = terrible NFL HC period. Dirk Koetter = complete focus on offense – still sh1t the bed in that area by never having a balanced offense and a scheme that produced yards but not points, going back to his days at other teams. No input or care on the defense at all. BA = understands and holds accountability for both offense / defense. His staff is much more mixed and diverse in terms of skill sets. Our QB room SHOULD be a LOT better. @the Joe(s) your coverage the last couple of weeks has been stellar, this article is another example of that. You’re asking the questions we fans want to know the answer to. Thank you. Anyone but Licht dealing with personnel. We all know he’s clueless. Great question man awesome answer also!!! I trust BA but unsure about his coaches especially Leftwich. not so sure about Lucy being the kickers coach though! You can’t get a great answer without a great question. Oh wow another dumb comment by the world’s dumbest fan base. Good joke gp. Looking at you. I felt BA would be sitting right by Licht in the draft room and would steer us to a better draft this year. It was great to read this article, Joe. I hope now that the Alliance of American Football has collapsed that BA will look at their tape and suggest who Licht should invite to tryout for our team for this season. There are players who have shown they can play at the NFL level if given a chance and can help us greatly in preseason and could be good backups for us this year. A good linebacker candidate is Jeff Luc 6’1” 251 lbs. and the League MVP would have been the QB of the Orlando Apollo’s who is a very accurate deep thrower and proved it this year. They had an older outstanding WR named Johnson, a shutdown CB, and a good playmaker at LBer too. If BA calls Steve Spurrier he can fill him in too. There were some outstanding linemen on both sides of the ball in the AAF too. If BA speaks to the Coaches of the Alabama Iron and the team in San Antonio, TX they can tell him along with Spurrier who to watch on tape. 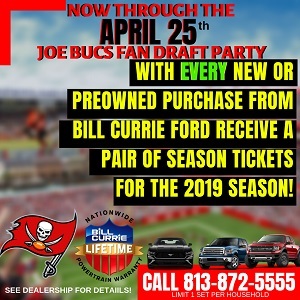 Joe, the next time you interview BA please ask him if he has looked at any AAF football players to invite to try out for the Bucs. It could make a big difference in helping the Bucs get to the playoffs this year. Anonymous – Are you nuts? The NFL didn’t think the AAF was good enough to be their minor league. No AAF player is going to be the difference in helping the Bucs to get to the playoffs this year.